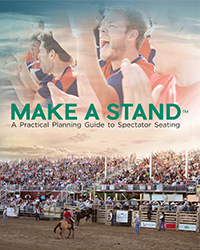 Make a Stand, A Practical Planning Guide to Spectator Seating includes case studies from successful projects throughout the U.S.
We know the benefit of spaces designed to encourage the gathering of spectators - from sports, to racing events, to rodeos, they bring like-minded individuals together who are united in a common goal or hobby. Ensuring comfort and access, providing the right mix of amenities, and creating a compliant atmosphere are all equally important in the success of a spectator venue. Until now, understanding the choices that are available could be confusing. Now, with the launch of PlayCore’s newest guidebook, Make a Stand, A Practical Planning Guide to Spectator Seating, facility owners have a resource to help promote, advance, and creatively support spectator seating initiatives and infrastructure. The publication features a history of spectator seating going back to ancient times, and the role these venues have played in gathering people to observe and encourage events. It also addresses standards and code criteria, planning and design, purchasing, and installation/maintenance. Perhaps most interesting, the guide shares case studies from seven venues, with details on design, procurement, and/or the installation process. From a facility looking to maximize a small space while addressing accessibility, to a large venue faced with budget constraints that limited their options, the case studies provide valuable insight for municipalities and site owners looking to maximize their own options to encourage the gathering and comfort of spectators. PlayCore helps build stronger communities around the world by advancing play through research, programs, and partnerships. They infuse this learning into their complete family of brands. PlayCore combines best in class planning and education programs with the most comprehensive array of recreation products available to create solutions that match the unique needs of each community they serve.